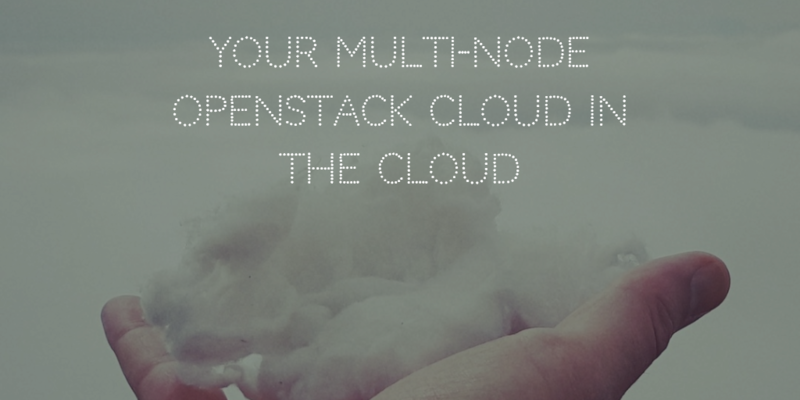 Installing openstack is not that hard, but it could be time consuming. When running your first installs, you probably want to prototype on instances instead of hardware, to shave time. It is basically one of the "cloud" principles: Focus on your goal (a business man would have said "value"), and rely on your providers whenever possible. So, for me, it makes 100% sense to deploy OpenStack-Ansible in the cloud. So what are the steps? Note: This post's relevance can change overtime, as OpenStack and OpenStack-Ansible evolves. If you want to deploy your OpenStack-Ansible cloud in the cloud, here are the top level steps. You want to have, like you would in hardware, an "OpenStack-Ansible"-ready operating system. Because currently OpenStack-Ansible requires1 your nodes to be on the same management network, you probably want them connected in some way. You then want to follow the usual steps for deploying ansible. connect to your cloud provider(s) to create your instances. This node is NOT the deploy node (but it could), it's simply your laptop or whatever. OpenStack-Ansible requires an Ubuntu 14.04 (up to Newton) or 16.04 (from Newton onwards) with specific packages. CentOS 7 is on the works, but let's focus on Ubuntu 16.04 for this exercice. Using a cloud provider already makes sense: Ubuntu being popular, you probably don't have to roll your own image, everything is probably already ready to work. Give your ssh keypair, select ubuntu 16.04 and DONE! a recent kernel, python2.7, enough RAM/disk on the infra nodes. Please check the current requirements for your version in the OpenStack-Ansible installation/deployment guide. You could do install these packages manually by running apt-get install x on each of those nodes. If you're like me, you probably want to automate it. Enters the preliminary step: Using ansible to prepare your operating systems. Warning: Using Ansible to bootstrap your hosts in order to deploy OpenStack-Ansible on your instances (one of these will be bootstraping Ansible for OpenStack-Ansible) can cause dizziness. But don't worry, we are not looping. To use Ansible, you better have an inventory. You cannot use the OpenStack-Ansible inventory at this point of the lab yet, so you need to write your own. The Ansible OpenStack dynamic inventory script relies on shade and your clouds.yaml (for example ~/.config/openstack/clouds.yaml), so make sure they are ready. Check your inventory by issuing python <your inventory script> --list. Now that your Ansible inventory is ready, you can see its layout is flat, except if you have given metadata to your instances. This lack of groups could be problematic. Use the ansible inventory merge behavior and complete the inventory with a static inventory file to make your life easier. For the in-memory inventory, you need tasks holding the group/host names. If these tasks are not using variables, you will prevent the reuse of the plays. If using variables, their location would be, in my opinion, far less obvious than the inventory (in play, in a variable file, in group/host vars, ...). Everytime you'd change your cloud node, you'd have to rewrite your ansible_host value. Tedious but ok for small tests too. Your pick. Now, you need to install the basic requirements for Ansible. This is technically required on the deploy node, but some other nodes may require them too. For safety, install the packages everywhere! ansible pre_osa -m raw -a "test -e /usr/bin/python || (apt-get -y update && apt-get install -y python-minimal)"
ansible pre_osa -m raw -a "apt-get update -y && apt-get install -y git build-essential python-simplejson libssl-dev libffi-dev bridge-utils"
Note: The above commands don't specify a user or elevation method, nor the path to the inventory you just created. Adapt it to your needs. Note: The above commands only list the packages needed at the time of the writing of this article. Please check what is required in OpenStack-Ansible by checking the bindep.txt file in the root of your openstack-ansible repo. Or just install bindep and use it. And move on the real stuff. The odds are really high that your cloud provider will prevent you from having network traffic coming to/from multiple ethernet addresses for one network. In general, you have one tuple (IP, hardware address) per network configured at your provider. Because OpenStack-Ansible is relying on bridging to put containers together on the same networks, only the host traffic will be able to go outside. It's perfectly fine from an all-in-one (AIO) standpoint, because in this case the external world will only speak to the load balancer on the host, and the rest of the OpenStack traffic will stay inside the hosts and don't need external world forwarding. This won't do in our multi-node scenario. You can do NAT, but I will not recommend it. This is a radical change from OpenStack-Ansible standard networking. You'll be on your own, probably will have issues with some software, and your future hardware deploy of OpenStack-Ansible will probably not be deployed with NAT for scalability reasons (therefore the reproducibility of this exercice is quite limited). On top of that NAT isn't really a good idea if you plan to have an OpenStack cloud from this century, i.e. with IPv6. You could deploy all your OpenStack-Ansible components on metal instead of in containers. You'd then multiply the amount of cloud instances you need, and complexity. Also I'd rather have the same configuration for OpenStack-Ansible in my cloud deploy as I would have in my hardware deploy. The other solution would be to encapsulate your Layer 2 traffic between your cloud instances: Your configuration won't change for OpenStack-Ansible, you'll only have different networking (and a smaller MTU in the case of cloud instances vs the hardware installation). Keep in mind that there are many roles in the ansible galaxy to configure your networking for your needs. Please note that the OpenStack-Ansible repo hides a hidden gem here, in the bootstrap-host role. OpenStack-Ansible uses this role (located in the tests folder) in its CI testing for configuring many things required to deploy/configure OpenStack. Note: the bootstrap-host role need the excellent config_template plugin to work. Make sure you have the plugin in your Ansible plugins path. You can override the plugins folder location by adapting your ansible.cfg file, or using environment variables. Alternatively, you may want to consider that the bootstrap-host role as a meta dependency to the openstack-ansible-plugins role, which makes possible to use the config_template easily. That's what I usually prefer. Adapt variables to trick the bootstrap-host role into doing your bidding. bootstrap_host_encapsulation_enabled: True #not really necessary to define it, but hell it doesn't hurt to be explicit. The trick here is that the bootstrap-host can configure a VXLAN overlay between all your nodes. This will be used to encapsulate traffic for br-mgmt, br-storage, br-vxlan, and br-vlan! There are many other solutions for solving this issue (I think of L2TPv3, L2VPN with MPLS/VPLS, Tinc, GRE, ...). If you're interested on how to do it in more details, contact me! ansible pre_osa -m shell -a "cat /etc/network/interfaces.d/*"
Alternatively, you can check the connectivity on the br-mgmt of the nodes by pinging the nodes manually. Step 3.0 Deploy and use! From now on, the nodes will be "like if they were on the same layer 3", which should be enough for your OpenStack-Ansible deployment. Use your br-mgmt IPs when configuring your conf.d/openstack_user_config and everything should be fine! Building overlays accross multiple datacenters/clouds is quite easy, and work by default in OpenStack-Ansible. Make use of it!